Toilet bowl cleaner quickly removes rust, stains, scale and residues from toilet bowls and urinals so you get professional cleaning with less scrubbing. Special clinging formula delivered with a built-in squirt top provides extended contact time on vertical surfaces. 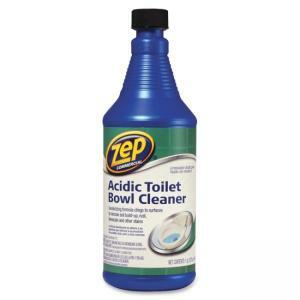 Commercial Acidic Toilet Bowl Cleaner leaves a pleasant, fresh minty pine fragrance. This product will not harm septic tanks or drain lines.